I’m hardly a typical New Yorker. Visiting Staten Island, of course, is a provocative act. If you’re a New Yorker not from Staten Island, you’re not supposed to visit Staten Island, you’re not supposed to care what goes on there at all, and if it gets around you’ve been there—they’ll come and revoke your rights to remain in Manhattan, Bronx, Brooklyn or Queens. After all, the island is full of rednecks, paintball players, so-called “goombahs” and, gasp, Republicans. If you’re a real New Yorker, you’re not supposed to ride the ferry or, if you’ve been taken aboard by out-of-town relations, you’re supposed to enjoy the ferry ride then shuffle around to the waiting room to pick up the next boat. I’ve been to Rossville, way out on Arthur Kill Rd. on the south shore, many times. Under its placid veneer of suburbia, there’s over 300 years of history there. The British arrived as early as 1684 and in the early days the area was called Smoking Point and later, Blazing Star, for a long-lost tavern (a separate Staten Island locale was called Bull’s Head, after another such tavern). By the 1830s the southwest Staten Island area was named for a local wealthy landowner, William Ross (who built a replica of Windsor Castle near the Blazing Star tavern). 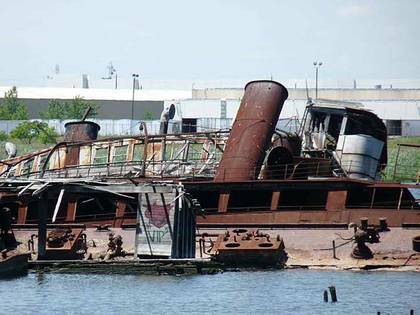 Ferries, and later steamships whose wrecks are still sinking in the Arthur Kill, connected it with New Jersey. After the West Shore Expressway was built in the 1970s, it spurred development south of the highway, with street after street filled with what songwriter Malvina Reynolds and Pete Seeger would call “little boxes made of ticky tacky that all look just the same.” North of the expressway are shipwrecks, auto repair shops, abandoned cemeteries, and assorted detritus that has been there for decades and may last decades more. Today Rossville is fairly compact and can be defined by the Arthur Kill waterway, the West Shore Expressway, the South Shore Golf Course and Woodrow Rd. A couple of things happened by the mid-1970s that pulled Rossville Ave. from the near-rural: a devastating 1973 brush fire burned down many local residences, and the 1976 opening of the West Shore Expressway which prompted local farmers to sell suddenly profitable land to local developers, who over the next few decades built the tract houses that gave Rossville the look it has today. Arthur Kill Rd. makes one of its closest approaches to its titular body of water in Rossville. The Blazing Star Ferry ran from here to Woodbridge, New Jersey and steamboats still docked here at the time the atlas plate was produced in 1873. I’ve come here since the late-1990s to gaze at the collection of rotting, corroding wrecks found here, as have some daredevils such as Nick Childers and Shaun O’Boyle. Founded in the 1950s by Arthur Witte Jr., the yard sits on a desolate stretch of land at the junction of Arthur Kill Rd. and Rossville Ave. Once described by The New York Times as an accidental marine museum,” the Witte Marine Scrap Yard accumulated far more vessels than it could dismember, and the boats quickly piled up. Arthur Witte intentionally stored the vast collection of ships for parts, but the wrecks became a habitat to teeming colonies of underwater fauna. A change in environmental law mandated that these eco-systems be untouched and the hulks endured. Over 400 ships inhabit the yard, now known as the Don John Iron and Metal Scrap Processing Facility. 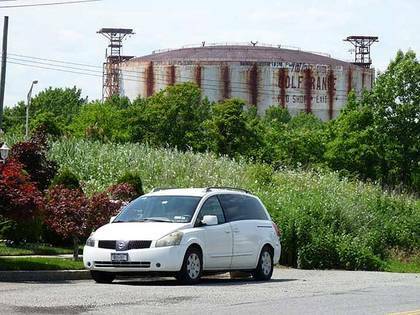 Vessels from all decades of the 20th Century lie in a state of decomposition and rust at this scrapyard at Arthur Kill Rd. and Rossville Ave. Most are tugs or cargo ships. The former piers have collapsed and are for the most part unpassable; these wrecks are officially located in the Witte Scrapyard and are off limits to the public, which hasn’t stopped dozens if not hundreds of urban explorers and gawkers from wandering out to these hulks and snapping away. Since Witte’s death in 1980 his descendants have slowly dismantled the boatyard, known by some locals as “the boneyard.” Among the ships “interred” at Witte was the fireboat Abram S. Hewitt, which aided in rescuing survivors of the General Slocum steamboat disaster in 1904, the US Navy submarine hunter PC-1264, “one of only two U.S. Navy ships to have a predominately African-American enlisted complement during the war,” and the tug YOG-64, which still remains. 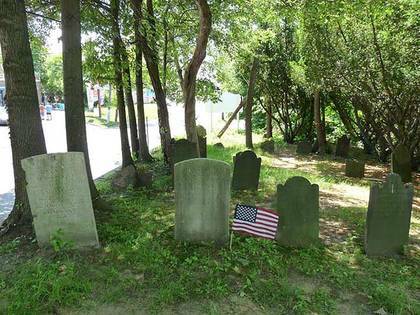 I’ve often called Pelham Cemetery in City Island, Bronx, New York’s only waterside cemetery, but after thinking it over, I’ll have to amend that to include the Blazing Star Burying Ground (aka Sleight Homestead Graveyard) on Arthur Kill Rd. east of Rossville Ave. It was founded before 1751, as that is the date on its oldest gravestone. The stones bear names familiar to Staten Island residents aware of the names on its street map: Sleight, Seguine, LaForge, Poillon. The last burial was in 1865 for John G. Shea, of the same family Shea’s Lane, now Rossville Ave., commemorated. According to Find A Grave, the Seguine family has the most family members buried here, with 11 of the surviving 46 gravesites. Here I’ve grouped the prominent sandstone markers, which although some of the oldest stones in the cemetery, still remain legible: though sandstone can and does decay, the marble and limestone markers the followed sandstone in the 19th Century are much more subject to the predations of wind, pollution and rain. 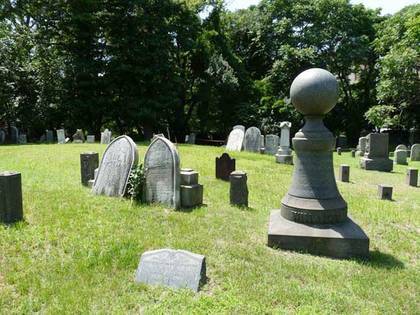 Israel Oakley (1739-1824), whose gravestone is the largest in the cemetery, was the great-great-grandfather of Staten Island historian William T. Davis, an entomologist by trade who wrote several Staten Island histories and guidebooks. He co-founded the Staten Island Institute of Arts & Sciences. Hiteita Simonson’s (1722-1789) marker has been by the side of the road here since the year of George Washington’s inauguration. Of course, Arthur Kill Rd. 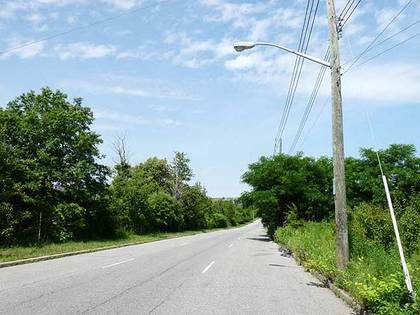 is likely an amalgamation of several roads along the Arthur Kill strait. It’s fascinating that such an ancient relic is within plain sight of the car wash, gym and succession of eateries along the south side of the road. Looking toward one of the two liquid natural gas tanks placed at Arthur Kill and Bloomingdale Rds. The tanks were outmoded almost as soon as they were built and were never filled, and have been left to sit and rust since. St. Luke’s Ave. is one of the oldest routes in Rossville. It runs one block from Arthur Kill Rd. to Veterans Road North, a service road of the West Shore Expressway. 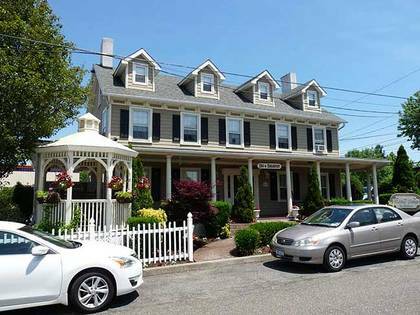 It’s an odd place for a bed and breakfast, but the Wedding Cottage is part of the region’s history. In 1844 St. Luke’s Church was founded in Rossville by several trustees of St. Andrew’s Episcopal Church in Richmondtown, among them William E. Ross. The new church was designed by Staten Island painter Jasper Cropsey. The attendant cemetery (see below) was also founded at this time, incorporating two older and smaller cemeteries belonging to the Woglom and Vaughn family cemeteries, where the older grave markers are found. Another tangible remnant of St. Luke’s Church is its cemetery, established in 1844 between Zebra Place (old Winant Ave.) and Bloomingdale Rd. In 1874 the church began selling gravesites to the public and thus, it has always been non-sectarian and non-segregated. St. Luke’s was absorbed into St. Stephen’s in Tottenville; as of 1920, St. Luke’s was losing parishioners, since by then the steamboat landing and local post office had closed, the mansions were becoming dilapidated and the stench from the factories in Carteret, NJ across the Arthur Kill were becoming overwhelming. Today, though, the cemetery is well-maintained and kept neat by the diocese of the Episcopal, or Anglican, church of New York. 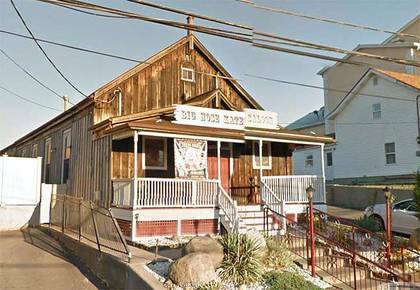 Another St. Luke’s church building is now Big Nose Kate’s Saloon, on a bend of Arthur Kill Rd. between St. Luke’s Ave. and Hervey St. Named on WCBS-TV’s list of best biker bars in NYC, the saloon is named for a perhaps better-known venue in Tombstone, AZ; both commemorate Mary Katherine Horony Cummings (1850-1940), the companion of John Henry “Doc” Holliday, dentist and participant in the famed Gunfight at the OK Corral. Big Nose Kate’s ghost supposedly haunts the Arizona saloon. 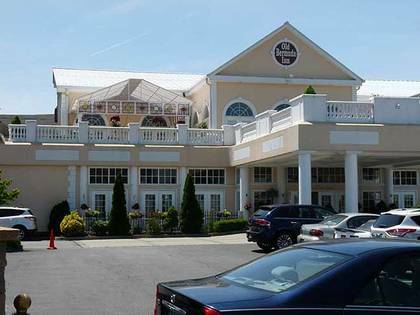 The sprawling Old Bermuda Inn was originally constructed in 1832—The New York AIA Guide reports 1855—by the Mersereau family. The older part of the expanse is at Arthur Kill Rd. and Hervey St., but the original restaurant has greatly expanded and built in recent years as it was converted to a wedding caterer and event space. Veterans Road East, the southern service road of the West Shore Expressway. I’m familiar with this road, since I would use it as a sort of “bike expressway” in 1977. Why 1977? That summer, years before assisting bicyclists became NYC policy, the Transit Authority, as it was called, operated a special bike bus on weekends from the 95th St. station on the R train in Bay Ridge across the Verrazano, ending just across the bridge on Fingerboard Road. I could bike all over the island, which I did on about four or five occasions, though this stretch of road is the only one I recall with any specificity. You had to be back at Fingerboard Road by four p.m., or else head to St. George and take the ferry to Manhattan and then ride the bike or subway back to Brooklyn. I didn’t miss the cutoff, though. The bike bus was a regulation 1960s-era GM “fishbowl” bus with the seats removed to fit the bikes; then as now, there were no bikes allowed on the Verrazano Bridge. The TA ended the service after one summer. —Kevin Walsh is the webmaster of the award-winning website Forgotten NY, and the author of the books Forgotten New York (HarperCollins, 2006) and also, with the Greater Astoria Historical Society, Forgotten Queens (Arcadia, 2013).